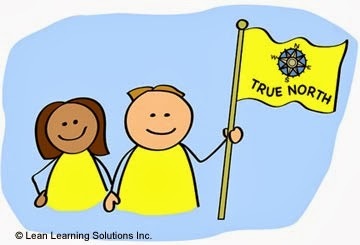 Lean Thinking: What is Courage & How does it relate to True North? What is Courage & How does it relate to True North? Prudence, Temperance, Justice and Courage. Courage -- the capacity to overcome fear -- is perhaps the most admired. "Something for the head, something for the heart..."
How does courage relate to True North? Breakthrough -- transcendent, enduring achievement -- requires all the Cardinal Virtues, and courage most of all. Courage, like True North, entails head and heart. Courage without the head is simply foolhardiness. Courage means you understand the risks, and do it anyway. Courage is admirable when exercised in the service of others, of a greater good, of True North. In summary, achieving True North requires all the cardinal virtues and none more than courage. In fact, all the virtues depend on courage.